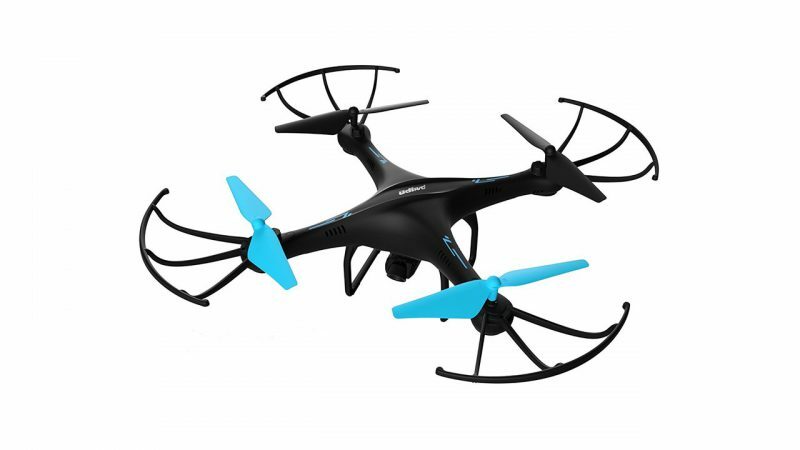 The U45 Blue Jay drone is a beginner friendly drone that comes with a lot of features that provide a lot of fun for all level of drone flyers. It comes with a 720p HD camera with FPV capability and can take 2 megapixel still images. The drone can also be paired up with compatible VR headsets for a more immersive flying experience. You can also draw custom routes on the mobile app and the drone will fly along the route unassisted. Other features include one-touch take off and landing as well as 360º flips. This is a fantastic drone for beginners. Welcome to another drone review, today I will be reviewing the U45 Blue Jay drone. 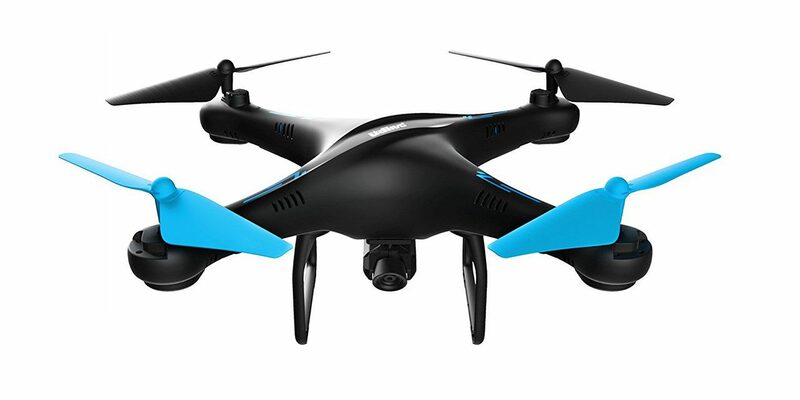 The U45 Blue Jay Drone is an ultra-newbie-friendly drone that combines ease of use and great looks with premium features like an HD camera with VR capabilities. 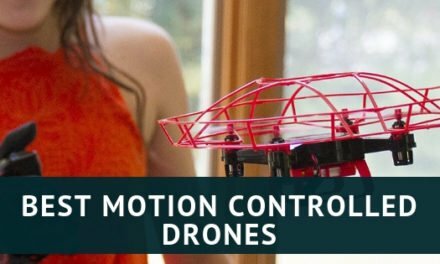 It also comes with some cool features like one button takeoff and landing and even allows you to create your own custom route for the drone to fly along. If you don’t want to read the whole review, I have summarized the main points in the box below. The U45 Blue Jay’s sleek and sporty appearance is easy on the eyes at first sight. The drone itself looks sturdy and feels sturdy, but it’s surprisingly lightweight. Being lightweight is a good thing in a drone, because it increases flight time by requiring less energy to fly. 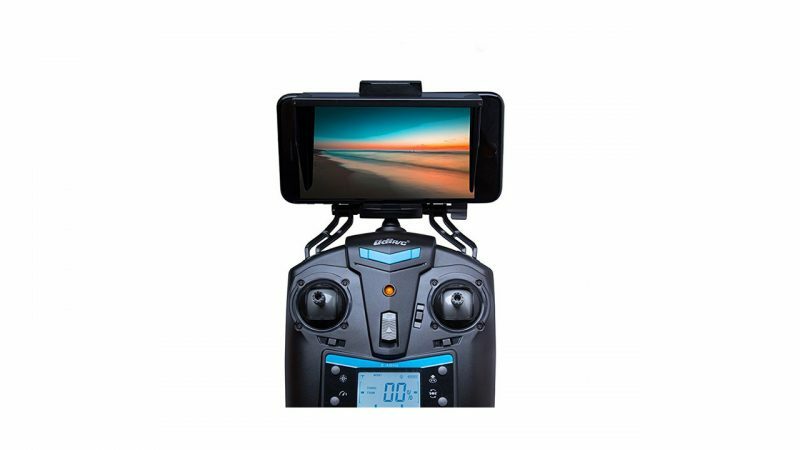 One thing that sets the Blue Jay apart from competitors is the fact that it synchs with your smartphone and is compatible with a few VR headsets, allowing you to get a live 360-degree view of what the drone sees—this is the first-person-view (FPV) feature. I was surprised that a drone that is relatively inexpensive came with VR capabilities. However, even though it may not provide the experience that the more expensive VR drones give, the fact that you can synch a VR headset is worth the money alone. Plus, since it’s FPV, you can easier get the shots you envision and make your artistic dreams come alive. I know that sounds corny, but it’s really true—it’s a great way to make videos. It’s as simple as that. Altitude hold allows the drone to hover. You can get some great shots that simply wouldn’t have been possible without this feature, so it’s a definite winner. Better still, it’s a one-key feature. Headless mode (also known as Intelligent Orientation Control or IOC) is another one-key feature that promotes ease of use. I personally prefer this flight mode because it just feels more natural: forward is forward, backward is backward. This makes it easier (and more fun) to do all of those cool-looking tricks like rolls and flips. The drone having a headless mode makes it great drone for beginners. The custom route feature is, hands down, one of the best on the U45 Blue Jay. You simply trace the route you want it to take on your smartphone screen and the Blue Jay will fly it. It makes you feel like a wizard or something and is another tool that promotes immersion. The Blue Jay comes with two batteries and a power bank. 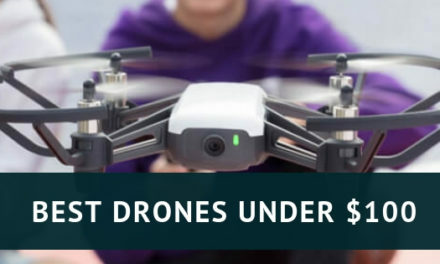 I’m a big fan of this, because as I have stated in my other reviews, you will need to purchase extra batteries because drone flight times for these types drones are just not enough. The U45 Blue Jay is a first-person-view (FPV) drone, which provides for a far better flying experience. The FPV capability is experienced through your smartphone which is held in place by a holder on your controller. The Blue Jay is capable of altitude hold, which means with the press of a button that it can hold its altitude, hovering in place, while you get the pictures and video you need to make your creative vision come to life. It also allows you to get a closer look at things when using the drone to explore new places. Headless mode (aka Intelligent Orientation Control or IOC) is a feature that lets you control the drone more easily so that its orientation is based on your orientation. That means when you press forward, the drone goes forward based on where forward is to you. This is a perfect tool for beginners, because it allows for a more natural feeling of control. Headless mode can be activated with the press of a button. The 720p HD camera on the U45 Blue Jay allows for crystal clear pictures and video and pairs perfectly with the altitude hold feature for quality shots and video footage. Additionally, it’s VR-capable, so when you synch your compatible VR headset with the drone controller, you can create a truly custom 360-view—all in rich HD resolution. Like I said in the beginning, you really do get some awesome features at a decent price. Like most other toy drones it doesn’t have a long flight time, you can get around 8 minutes but the good thing is, it comes with extra batteries, so you will not need to wait around for one to charge to start flying again. Its range on a good day is around 100m, if the weather isn’t that clear, the range will be decreased. I would advise against flying any type of toy drones in rough weathers. This drone is one of the best toy grade drones I have reviewed and if you are a beginner and looking to purchase your first drone, this will be a great choice. 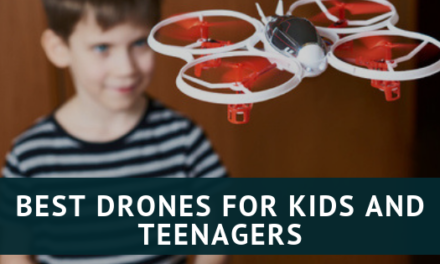 Not only is it good for beginners but it will also make a great drone for kids, it’s one touch acrobatic manoeuvres and FPV capability means there is something for everyone with this drone. Some of the features within the U45 Blue Jay drone are features you would expect to see in more expensive drones. Like for instance, it can be paired with a compatible VR headset. When you add custom flight paths to the mix—drawn by your hand on your screen—the result is a drone that provides for a fun experience. Plus it is durable and its design and material make up means it will not break up easily. It’s definitely a drone to check out whether you’re a novice or an expereinced pilot—I recommend it. There is no return home function; however, this isn’t a big deal, because the navigation makes it easy to keep up with and the one-key landing feature will bring the Blue Jay to a gentle landing. The live mode can be a little choppy if you get the drone too far away from your phone; that said, this isn’t much of an issue since all drones are limited to a flight range. The technology attached to this model is superb especially the VR compatibility. Having a mounted integrated camera is certainly a cool feature and one could spend all day playing around with this device. Although with only 8 mins. flying time, this is a little disadvantage. However as we go forward, I suspect that this element of the drone will improve. Pricewise, coming in at $130. its very affordable. Thanks for stopping by and commenting, this certainly is a very good drone especially with the features you get with it and its low price. I always say to buy extra batteries for whatever drone you purchase,flying around for less than an hour is never enough. Hi! This drone sounds really good. I have a couple of questions though. Does the camera provide any kind of protection (especially in landing)? Is that an industry standard? Also, from reading the headless mode part, can you provide more information on how that works? U45 Blue Jay sounds really interesting. Sounds like something I might want to get. There is some protection for the camera by the way of the landing legs,this should make sure that your camera doesn’t touch the surface. Headless mode simply means your drone will fly exactly the way you would want it to. When you turn left, the drone will turn left,however without headless mode it becomes a bit more confusing as you will have to know where the drones ‘head’ is at all times this is because the controls are not as straight forward as they are when a drone is in headless mode. thanks for the thorough review. You obviously know your drones, so it is useful for an expert to explain the plusses and minuses of this particular model. It sounds like even a beginner like me could easily handle this drone. What I wonder is the capability for using in real estate? I know this is more a toy, but it seems like it would work to view buildings or houses. 8 minutes seems like a short flight time, and you even mention that. You had me in the first sentence with this being an ultra newbie friendly drone. That is where I am at right now. I am in the beginning stages of looking for a starter drone. I like the fact that this has altitude hold, that seems like a really great feature for beginners. It seems like the camera is pretty good for an entry level drone. Are there any age recommendations for this one? I know as soon as I buy one, my 12 and 14 year old kids are going to want to try it. Actually, they will probably be better at it than I am. I also really like the extra batteries, 8 minutes will probably go by pretty quickly on one battery. Thanks for sharing your review, I appreciate it. Thanks for stopping by and commenting,this drone is actually perfect for beginners and kids,with its FPV capability and one button acrobatics maneuvers they will enjoy this drone immensely. I bought the udi u45 raven in amazon, a similar model without the phone holder and flight path feature but cheaper by half the price coming in at $59.00, I will vouch for your review i am a complete newbie to flying rc’s, and this one is very durable crashed it maybe 10 times already practicing in my 300 sq ft apartment studio and nothing has broken, once my flight skills improved i can truly.attest how newbie friednly it is. Thanks for stopping by and commenting, yes the raven and blue jay are pretty similar, although because of its fpv capability I do prefer the blue jay. With the rise in popularity, I think drone manufacturers are trying to make them as beginner friendly as possible.